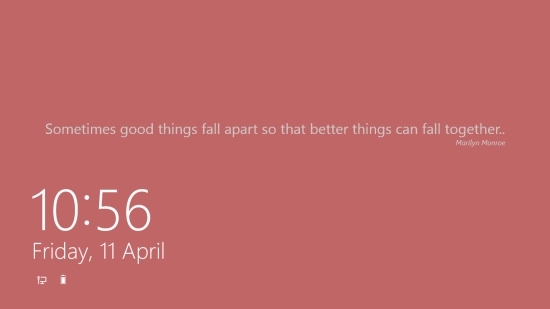 QuoteWallpaper is a free Windows 8 Wallpaper app that lets you set beautiful quotes on your lock screen. It is a very unique wallpaper app, different from the other theme-based usual wallpapers apps offered by Windows Store. Using this Free Windows 8 Wallpaper app, you can create and save quote wallpapers, and also set them on your lockscreen. So, you can set a new inspirational, funny, love, or friendship quote everyday on your lockscreen and makes it look different! This application is very simple to use and lets you easily set ‘quote wallpapers’ on your lockscreen. You can type a quote, its author’s name and see a preview on the same screen. 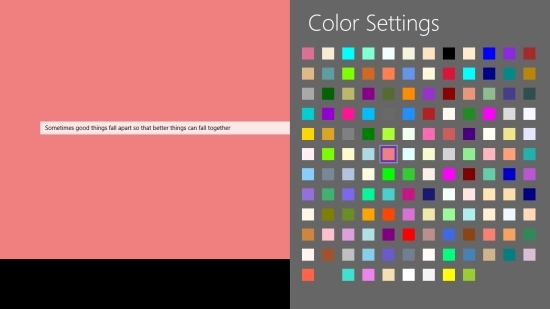 You will also find a huge color palette to select background color of the lock screen. QuoteWallpaper is freely available in Photo category of Windows Store. To view the app directly in Windows Store, click on the link given below at the end. Let’s have a look at this Free Windows 8 Wallpaper app. QuoteWallpaper is a single screen app with a user-friendly interface. The main screen of the app will direct you to type your quote and author’s name. It is optional to add the author’s name. So, you can either add it or not, as you like. As you type your quote and author’s name in the directed fields, a preview will be generated just below it. Now, right click on the screen. The app’s bar will display two options: Set as Lock Screen and Save; and Change Color. Using the Change Color option, you can select a color from the color palette, and set it as the background color of your lockscreen. To save quote wallpaper or set it on your lockscreen, click on Set as Lock Screen and Save option on the app’s bar. You can select an output folder destination and save this quote wallpaper as jpg, png, bmp, gif, or tiff image. Also try Quoter and Quotes By Category. QuoteWallpaper is a wonderful app to give a new meaningful look to your lockscreen. There are amazing color options to choose from as the wallpaper background. However, it would have been better if it had some text formatting options as well. Give this app a try to give a different look to your lockscreen. Share your feedback via comments.